I’m always seeking ways to use left over roasted chicken in my house. This is largely because Scotty and I have a secret pleasure – hot chicken sandwiches consisting of fresh bread rolls, warm roasted chicken from the local chicken shop, baba ganoush and lettuce. As there is only two of us in the house (and we are determined not to get the get the dogs addicted to the gourmet delights of roasted chicken), we usually need to come up with inventive ways to use the left over chicken. 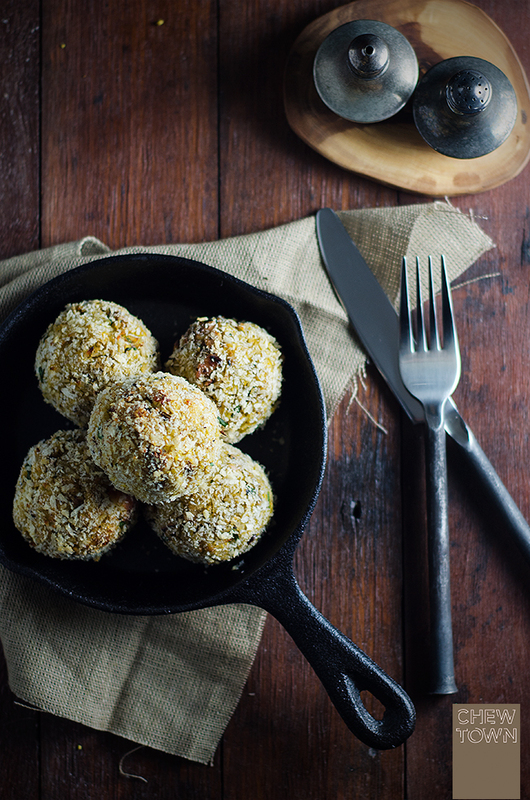 There are two things you’ll find feature often on Chew Town – fritters and arancini. These are my perfect left over, fridge clean out go to dishes that an Italian girl learns from her mother at an early age, to create little bites of something spectacular from bits and bobs. For me, a store-bought roast chicken is wonderful when freshly made and eaten hot, after that I lose most of my love for it. So when there still half a chicken left after we’ve eaten our sandwiches, there is nothing better than forming little balls of perfection by pulling apart the chicken, adding rice and other ingredients sourced from my ever giving fridge and pantry, crumbing them, cooking them and eating them as quickly as possible. Influenced by my prologue above, I bring you Chew Town’s Baked Chicken and Pumpkin Arancini. Now, I’ve baked these beauties because I try not to do too much deep frying in this household. But, if you aren’t averse to a bit of deep frying, these babies would be even more amazing deep fried. Reserving the breadcrumbs and olive oil, mix all remaining ingredients in a large bowl until well combined. Form mandarin sized balls out of the mixture and set aside. Place breadcrumbs in a shallow bowl and roll each ball in the breadcrumbs until well coated. Place on a lined baking tray and spray liberally with olive oil. Transfer to oven and bake until piping hot and crisp on the outside, about 15 – 20 minutes. 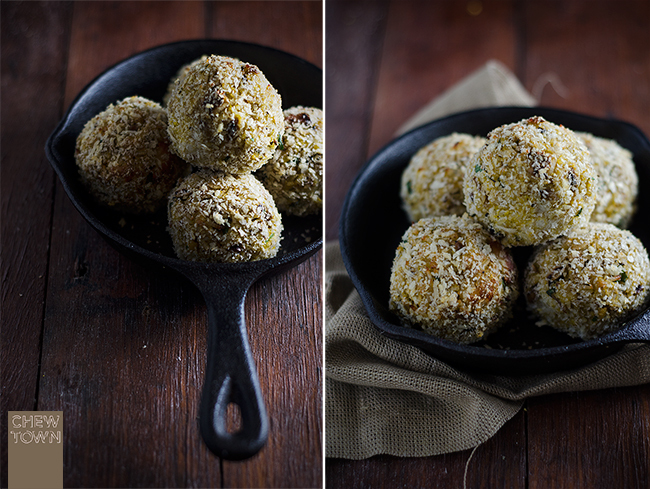 Love this – I’ve never thought to bake Arancini – what a brilliant idea! I tend to use a lot of leftovers in frittatas. Don’t often make aranchini, and I should – so tasty. Ooo good! I have leftover roast chicken in the fridge right now! How good is homemade arancini?! I love it 🙂 I haven’t added pumpkin to them yet. I definately will next time though! Recent Post: Thumb Print Coconut Macaroons + A Kez’s Kitchen Give Away! YUM 🙂 you’ve practically mixed the two things I like the most together chicken and pumpkin! I’m not really a fan of rice but still would love to try one of these rice balls! Gosh it’s been a while since I’ve visited and your photos just keep getting better and I think you’ve changed the layout a little 🙂 ME LIKE IT! A brilliant way to use leftovers. I love the idea of baking and not frying, hadn’t thought of that one for arancini. I will admit that when we buy BBQ chook, Sally is the forth ‘person’ to have dinner from it. These look much harder than what you’ve made them out to be. Great way to use left overs, it just never occurred to me. amazing photos! this sounds like a brilliant way to use up roast chicken leftovers! What do you recommend to replace Panko with that GF. Something that still gives that texture?